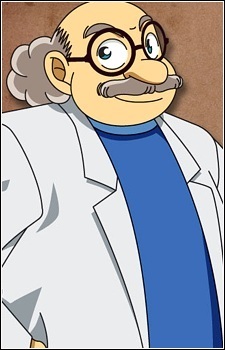 Agasa Hiroshi is an inventor and Shinichi's closest neighbor, living in a large house right next to the Kudou residence. He makes his living with a wide number of patents and inventions, mostly video games (of whom the Detective Boys are enthusiastic test players). He has been a friend of Shinichi and Ran since their childhood years. After Shinichi had been shrunk by the APTX 4869, the first person he met and entrusted himself to was Agasa. After having been convinced that the little boy was Shinichi, Agasa was also the first one to advise Shinichi to exercise caution in his pursuit of the Black Organization. He also helped Shinichi in establishing his new identity as Edogawa Conan, including constructing several gadgets which help Shinichi in carrying on his detective work surreptitiously, and in order to perfect Conan's cover, he also enlisted him into Teitan Elementary and thus came to know the children who would form the Detective Boys. When Miyano Shiho fled the clutches of the Black Organization, she fled to Shinichi's house but collapsed from exhaustion before Agasa's doorstep. Agasa subsequently took her in, learned about her true identity and helped her establish her new identity as Haibara Ai. He also entrusted Shinichi's parents with the secret about what has happened to their son. Agasa is a jovial and outgoing person and has many friends in his community, a fact which helped him in his covering up of Conan's and Haibara's true origins (he simply claims that they are the children of his friends and acquaintances). Agasa has a special love for pasta and tomato juice. Detective Conan is a popular shounen anime that has enjoyed a long run of nearly 20 years. If you enjoy murder mysteries and crime riddles, this is definitely the anime to watch! Here are some of the most familiar faces.